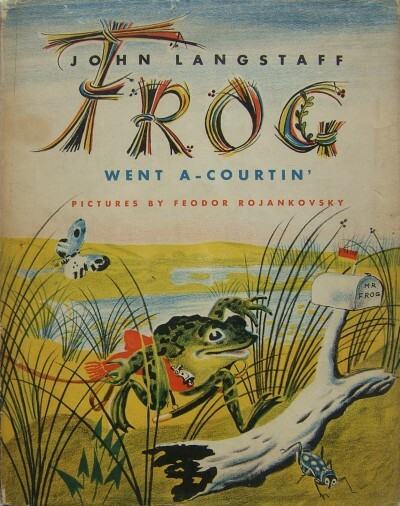 Frog Went A-Courtin’; written by John Langstaff; illustrated by Feodor Rojankovsky; Harcourt Brace, 1955. Rojankovsky illustrated several books in the 1930’s under the pseudonym ‘Rojan’. He illustrated a number of the early Little Golden Books, including the thirteenth title, The Golden Book of Birds (1943, $240 VG+), along with LGB’s The Three Bears (#47, 1948, $100 VG+), A Name For A Kitty (#55, 1948, $100 VG+), Our Puppy (#56, 1948, $100 VG+), and Gaston and Josephine (#65, 1949, $100 VG+). The Golden Book of Birds was issued with a dust jacket (the first 35 LGB’s were issued with dust jackets); the others were issued without dust jackets. Rojankovsky illustrated the four books in the ‘Just So Stories Series’, authored by Rudyard Kipling and published by Garden City in 1942, which have solid collector interest. The four books in the series are: How The Camel Got His Hump, How The Leopard Got His Spots, How The Rhinoceras Got His Skin, and The Elephant’s Child. Rojankovsky’s illustrations grace Harper & Brothers’ The Tall Book of Mother Goose (1942, $240 VG+) and The Tall Book of Nursery Tales (1944, $220 VG+), both of which have a solid collector interest, and are challenging to find in first edition format with dust jackets. A year after the Caldecott Medal award, Langstaff and Rojankovsky collaborated on another book, Over In The Meadow (1957, $120 VG+).